1. I began researching in Computer Science at the University of Washington in 2004. At the time, I worked in the Online Learning Environments lab, where I used artificial intelligence to build probabalistic models of student learning. These automated systems tracked and reacted to student input, in order to facilitate the learning process. 2. Following this, I moved to the Neural Systems lab to work on statistical machine learning algorithms for brain-computer interfaces. I worked with data collected from patients suffering from chronic epilepsy, who had grids of electrodes implanted directly on to their cortex. By looking at ongoing electrical brain activity, we aimed to detect one's intention to move and turn their thoughts into actions (for instance, by moving a cursor on a screen). 3. My interest in artificial intelligence naturally transitioned into cognitive neuroscience. I moved to the EPFL in Switzerland, and wrote a Masters thesis on the use of various machine learning algorithms to detect imagined body movements. I applied these algorithms to data sets of electrical brain activity collected in a series of experiments. 4. I then moved to a Cognitive Neuroscience lab, where I united the fields of body perception (cognitive neuroscience) and brain-machine interfaces (neural engineering). I performed a series of cross-disciplinary empirical studies and developed theoretical accounts of how the brain deals with sensory (bodily) illusions, studied our ability to voluntarily modulate our own brain activity, and investigated what happens when we interact with our environment via actions controlled by our thoughts, rather than our physical body. My doctoral dissertation summarizes it all. 5. In my current research, I've managed to bring together my scientific and musical/artistic sides. I study the creative process, musical improvisation, flow, and interpersonal synchrony. I look for the brain mechanisms and environmental factors that lead to spontaneous creation. In asking questions about how we generate new ideas, I hope to understand how to facilitate creativity. Still curious? Have a look at some of the detailed descriptions on this page, or see my publications. 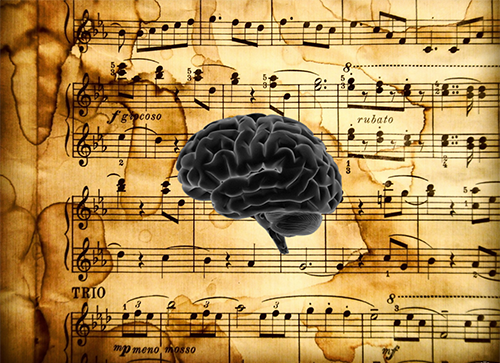 My current scientific research is focused on the psychological and neurophysiological mechanisms underlying spontaneous creativity, often using musical improvisation as a reference paradigm. I also muse on the interaction between Art and Science, curious as to how these two enterprises can be of co-inspiration. I investigate flow, also called “being in the zone”. It’s the feeling you have when you are completely and effortlessly absorbed in an activity, where it feels like your actions and responses unfold naturally and automatically, despite their complexity. When in flow, you experience an altered state of consciousness characterized by immersion in the present moment and a distortion in your time perception. Perception is simplified: self-reflective thoughts, criticisms, and doubts fade away and actions merge with awareness. I believe that flow states are related to the Unconscious and that they facilitate the generation of novel ideas. By stripping away our mechanisms of conscious control (e.g. logic, categorization, prediction) we permit ourselves to tap into a web of associations that are beyond logical comprehension and which closely draw from our emotional states. I utilize a combination of techniques from cognitive neuroscience, neuroimaging, and experimental psychology alongside theoretical frameworks from psychoanalysis (the Unconscious) to better understand what leads us to flow, as well as to discover the neural activity leading to spontaneous creativity. I work closely with musicians, from whom I record electrical brain activity while they improvise on their instruments. Our experiments aim to better understand what happens in the brain during these special moments of creation as compared to simply rehearsing or interpreting other’s work. I'm involved in a number of sub-projects: (1) the ability of external observers to detect the onset and offset of creative flow states in musicians, (2) the relationship between the hyper-associativity of creative flow states and the psychoanalytic Unconscious, (3) study into the electrophysiological changes associated with creative flow as compared to other flow states, and (4) the synchronization of creative flow states across persons in social contexts, for instance in groups of improvising musicians. Humankind is in a state of rapidly accelerating technological advance, where once-distant future technologies have consistently become todayʼs reality. Paralleling our techincal achievements, scientific advances have led to an accelerated accumulation of knowledge about the innerworkings of the human brain. Yet, as we move progressively toward technology-assisted tool use, tele-presence systems, medical robotics, and brain-machine interfaces aimed at the repair and augmentation of human cognitive and motor capacities, there is an increasing need to understand what happens when brain “merges” with machine. What are the subjective, perceptual, motor, and neural consequences of this fusion? 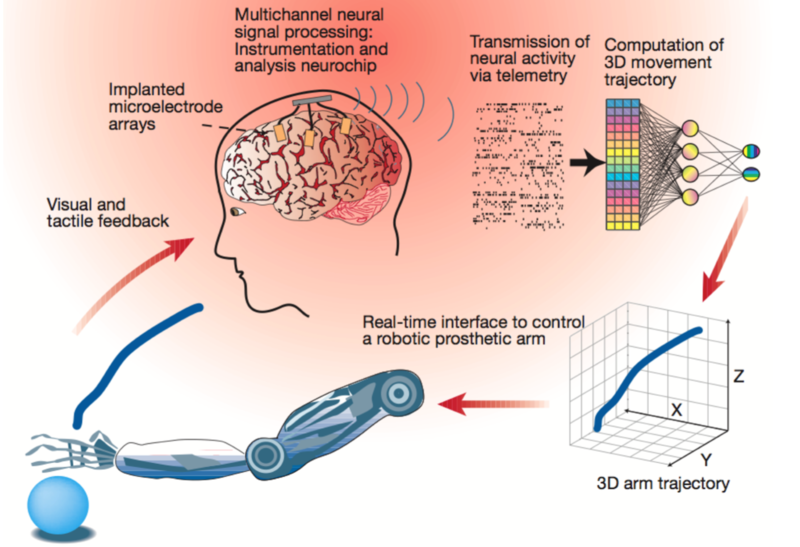 Can we use this knowledge to better design ergonomic neuroprosthetic devices aimed at enhancement, rehabilitation, and repair of neurological disability? In this research, I investigate these issues by providing converging evidence from a set of experiments designed to draw links between two previously independent research domains: the cognitive neuroscience of bodily self-consciousness and the engineering of brain-machine interfaces. I used paradigms taken from the imagination of movement (motor imagery), and performed experiments that mixed immersive Virtual Reality with neuroimaging and probabilistic modeling. Have a look at my dissertation for the full story, or look through my publications. 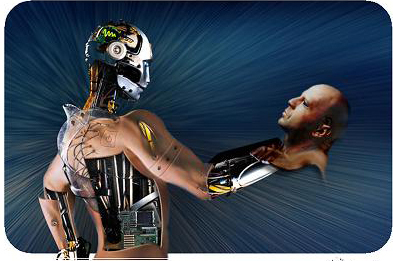 Brain-machine interfaces (BMIs) form a communication channel between brains and machines. translating one's neural activity into actions (or more simply, "thought control"). Neural engineers work to improve the performance of BMIs for rehabilitation and repair of patients with motor diabilities. In this research, I took inspiration from BMI frameworks and their methodology of decoding, translating, and analyzing neural data. I applied these methods to analyze data collected in experiments in cognitive neuroscience, where participants were asked to imagine spinning their body (without actually moving) while their brain activity was measured using electroencephalography. Using machine learning techniques, I looked at electrical brain data to see if we could distinguish between left and right imagined full body rotations. Have a look at my Masters thesis for the full story, or look through my publications.